You are here: Home / Blog / How much does it cost to drywall a garage? Now that I’ve got one wall completely finished, I thought it would be a good time to talk about how much it costs to drywall a garage. There are a couple of cost estimates online, but (as usual) they didn’t cover everything involved with putting up drywall. So, I’m going to go into detail and cover ABSOLUTELY EVERYTHING that I used to drywall my garage…mistakes and all. Disclaimer: I wanted to do it right..as “right” as can be expected since I’m an amateur homeowner who’s never put up drywall before. If this were in my living room, or anyplace that my fiancee would be walking past every day, I’d probably hire someone to do this for me. In other words, this isn’t professional advice, this is just how I went about it. How much does it cost to drywall a garage? If you’re doing it yourself, the materials will cost about $0.50 per square foot. The cost of tools you’ll need are about $60, but they can be used again for later projects. If you’re hiring a contractor, expect to pay between $1-$2 per square foot depending how smooth you want the wall. When I was researching adding drywall to my garage, I saw some wildly different estimates online. Some places gave a figure of $1.50 per square foot (about $300 per wall), while some quoted as much as $3000 for the entire garage. Before you decide which route to go, check out my article where I talk about if a finished garage adds to the resale value of your home. Hanging drywall normally means people will physically hang the drywall on your wall, working around windows and doors, trimming where necessary. Their job is done when the wall is ready for taping. Taping drywall is the other half of the job. The contractors work with bare drywall and use mud and tape to make a smooth surface for painting. There are 5 levers of drywall finish which I’ll get into a little later. It’s important to know which one you’re paying for. Finishing drywall is the most ambiguous. Usually it means the exact same as “taping drywall”, but it can combine both hanging and taping drywall. It depends on the contractor. If you get a quote for finishing drywall, make sure you get specific details what all is covered. Personally, if I’m paying someone and I expect a paint-ready wall when they’re done, I’d be a little ticked off if all they did was LITERALLY hang the drywall. That’s one of the reasons why I decided to do the project myself. It definitely took longer, but I saved a ton of money and I didn’t have to deal with contractors. One more area that you need to know the right questions to ask your contractor is what finish level do you need if you’re drywalling your garage? There are actually five levels of drywall finish ranging from gaps and exposed nails to a perfectly smooth finish. Obviously the higher the finish level, the more it’s going to cost to drywall a garage – either in money or your own time. Why would you want a higher drywall finish? The glossier the paint that you want to use on your wall, or the brighter your garage lighting, the higher the finish level you need. If there is harsh, bright lighting in your garage, any shadows that are cast on your wall will be like a neon arrow pointing at any imperfections in the wall’s finish. The same goes for glossy paints which reflect light back to your eyes. I wrote an article on the best paint for garage walls that goes into a lot more detail on which paint finishes you should use for your garage. 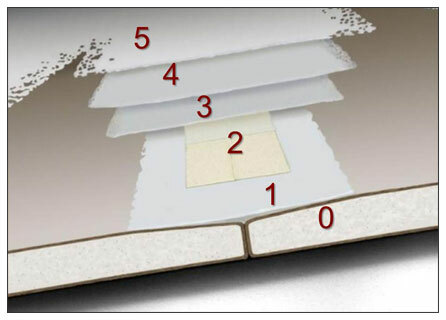 There are a bunch of articles online which talk about the five drywall finish levels. The best one I found was at constructiondesignworks.net, who also created the image above. I’ll highlight the levels briefly, but you should definitely check them out for more details. Level 0: This is a “lack of finish” level. The drywall is simply hung on the wall. You can see gaps between the sheets and exposed screws or nails holding it up. 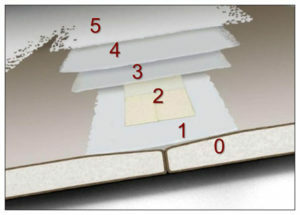 Level 1: The gaps and joints are covered with a layer of mud and joint tape. This is normally only found in areas of the building that nobody will ever see. Level 2: There’s a layer of finishing mud over top of the drywall tape to help smooth out the joints. There can still a fairly pronounced bulge (speed bump) over the joint. Screws or nails are covered as well. Level 3: There’s an extra layer of finishing mud over all joints and screws\nails. Usually this layer is spread with an 8″-10″ joint knife for a more gradual hump over the joint. Level 4: Yet another layer of finishing mud over all joints. This layer is usually spread with a 12″ joint knife and may even be a full 12″ on either side of the joint. You’ll be hard pressed to see the joints, so this level is good if you’ll be painting with a satin or flat sheen paint. Level 5: An extremely light, skim coat of drywall mud is applied to the entire wall to help create a uniform wall surface. This finishing level is needed for any type of glossy paint or if you’ve got bright, harsh lighting in your garage. If you’re hiring someone to drywall your garage for you, you’ll usually end up paying almost as much for the skim coat (level 5) as you would for hanging and finishing the drywall to a level 3 finish. A lot of extra time is spent sanding and getting a super-smooth finish. Each coat usually means another trip back out to your house for the workers. Since I was doing it myself, it just meant I had to wait a day in between coats to allow the drywall mud to dry. 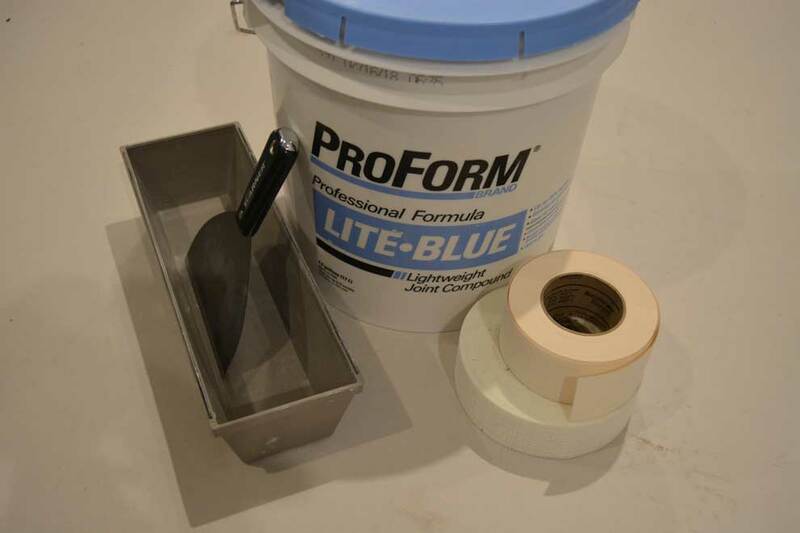 The materials you need to drywall your garage aren’t as expensive as you might think. To be honest, they’re so cheap that it makes me wonder why more people don’t take that extra step to finish their garages. One important thing to consider first is whether you need a permit to drywall your garage. Depending on your municipality, it may be an extra cost. Here’s exactly what I paid to drywall one 10′ high x 20′ long garage wall. Depending on your local building codes, you may need as thick as 5/8 inch drywall, which is often called “fire-code” drywall. If your garage is attached to your home, like mine is, the wall between the garage and your living space will need to be thicker, 5/8″ fire rated drywall. In my case, that’s the wall between the garage and the kitchen. If there is a fire in your garage, that will help slow it’s progress. If you’re just covering concrete block like I am, you can opt for the thinner 1/2″ drywall panels. Either way, expect to pay between $10 and $15 per 4′ x 8′ sheet (48 square feet). Always get an extra sheet or two, especially if you’re just starting out, so you have room to make some mistakes along the way. For my 10′ x 20′ garage wall, I bought eight sheets @ $11 each, for a total of $88. When everything was done, I had a full sheet and pieces of a second sheet leftover, so I could have saved some money here. Here in the US, we only have a couple of different options for joint compound. The most popular ones are All-Purpose and Lightweight. In Canada, there are different compounds for each step in the process: taping mud, durabond, finishing compound, dust-control..as well as the lightweight and all-purpose mud we have down here. Each different joint compound is formulated to different strengths and consistencies, depending on how you’re using it. In the US, we accomplish almost the same thing by adding water to thin down the consistency of the mud. We lose some of the specific characteristics of the different mud, but we can buy one tub of it and use it for everything. I bought a 1-gallon tub of premixed joint compound and burned through it the first day. I vastly underestimated the amount of drywall mud I’d need to do a wall. After that initial mistake, I bought a large, 60 lb tub of all-purpose, pre-mixed joint compound and it lasted the entire wall with a lot of compound leftover. Total cost was $14. There’s two basic types of drywall tape and I recommend you get both. For larger gaps between panels (bigger than 1/4 inch wide) I recommend using a mesh tape initially. By attaching the mesh tape over the gap and then literally stuffing joint compound through the mesh into the gap, the mesh acts like a support to keep the mud in place. You don’t want to use the mesh tape everywhere, since the mesh isn’t as smooth as the paper tape. But it’s great for filling large gaps in your wall. I bought one roll each of paper tape and mesh self-adhesive tape for around $3 each. Depending on what you’ve already got in your tool chest, things could get expensive. I had to start from scratch so this started adding up quickly. I’m going to list all of the tools that I actually ended up using first, and then I’ll have a second section of tools that I bought, but never found a use for. A drywall mud pan is simply a rectangular, shallow bucket for the mud that you’re working with at that moment. It’s got to be wide enough to accommodate your widest knife, and not too deep as to dry out your mud. You can usually find these at any big-box store for between $4 for a plastic pan and $18 for an all-metal pan. As long as you get a pan with a metal edge on the top to clean off your blade, there’s no reason to go expensive here unless you’re going to be doing this for a living. I bought a plastic mud pan with a metal cleaning edge for $4. One thing to note. 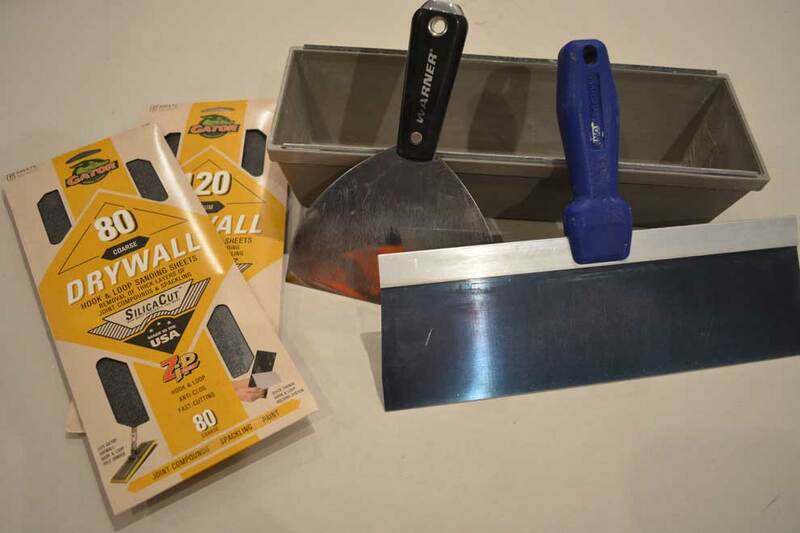 When you’re shopping for tools, you’ll see drywall hawks, which are flat metal panels with a handle on it. You use them almost like an artist’s pallet. The way you hold them helps your wrists, but it doesn’t allow you to thin down your mud as much as you may need. If you’re doing a huge amount of mudding (like dry-walling a garage for farm machinery), then a drywall hawk will make that process easier. You’ll still need a mud pan for the times you want to thin down your mud. This is your most important tool, so if you’re going to splurge a little….do it here. I used my 6″ knife for everything except the final finishing coats. Important points: You’re looking for a knife that is comfortable to hold, with a good grip that won’t slip out of your fingers. The blade needs to be metal (not plastic). It’s critical to buy a blade that won’t get nicked or scratched on the edge. Even a tiny imperfection on the edge will find it’s way on to your wall every single time. You’ll see “blue steel” and “stainless steel” knives. Blue steel tends to be lighter and more flexible than regular stainless steel knives. It’s usually a matter of personal preference which you want to use. You can usually find these knives for between $5 – $15. I’ll say it again, don’t cheap out here. It’s only an extra couple of dollars and it makes a huge difference in the end. I bought a 6″ stainless steel blade from Marshalltown with a soft, textured, rubberized handle for around $10. Well worth the extra $3 above the basic steel model. Similar to the 6″ knife, but used really only in the final finishing steps. Here I wanted a blue steel knife for the extra flexibility in the blade. You’ll still want a comfortable, non-slip handle but the blade is the critical piece in this step. I bought a 12″ blue steel taping knife for $10. This tool is a lifesaver! Depending on the layout of your garage, you’ll have at least a few inside corners and maybe some outside corners. If you stand at a corner and the walls are coming toward you, that’s an inside corner. If they’re going away from you, it’s an outside corner. An inside corner trowel will let you mud the wall joint and get a consistent, smooth finish in the corner the entire way down the wall. This tool almost made it too easy, so I can’t recommend this enough. 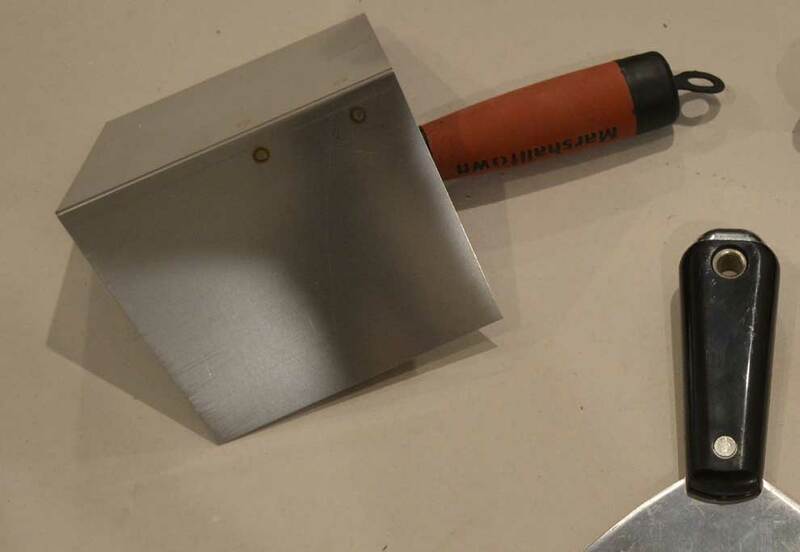 I bought a Marshalltown corner trowel for around $8. The biggest pain in the *%@ about drywalling your garage is sanding the drywall between coats of mud. You want a smooth finish, but sanding down a 200 sq foot wall is murder on your shoulders. So I highly recommend getting a good pole sander to help you out. A pole sander is just a removable sandpaper head on a long pole. You want to get a head that will lock in the sandpaper so it doesn’t slide around, but beyond that, there’s not much to these tools. To make things easier on yourself, make sure you get the same brand of sandpaper as your pole sander’s head – or at the very least make sure that it’s compatible. Initially, I bought sandpaper that was cut slightly differently that the sander head that I had and it was constantly slipping as I was sanding the wall. You’re going to want a good assortment of sandpaper grits: 80, 120, 220 at a minimum. If your mudding went well and you’ve got nice, smooth edges, you can swap out the 80 and 150 grit sandpaper for 100 and 150 grit paper. My initial joints weren’t that smooth so I had a lot of sanding to do early on. I bought a Gator pole sander for $15, and several different grits of sandpaper for around $5 each. I had a spare pole in my garage already from painting. Depending on what YouTube training video you watch, they’ll tell you that you need a different length knife for each stage of the finishing process. That’s great in theory, and if you’re a professional, then by all means get specific tools for the finishing stage you’re on. But for most homeowners, you don’t need an 8″ or 10″ finishing knife. I used my 8″ knife once to do a finishing pass on my inside corners, but that was it. I still went over them again with a 12″ blade. My 10″ finishing knife only say action when it was cutting drywall tape to length. It happened to be the closest tool at the time, but not really what it was designed for. I mentioned earlier in the pole sander section that I bought the wrong sandpaper for the sander head that I had. Since I’d already spent more on the sandpaper than I did on the head itself, I bought another head (the Gator) that was compatible with the paper. Not buying these would have saved me about $30, so take a lesson from my mistakes. For my 10′ x 20′ garage wall, the total cost of my materials ended up being $107, which worked out to about $0.53 per square foot. Not bad at all, but I spent A LOT of time mudding and sanding to get the finish I wanted. If you don’t enjoy doing the work yourself, or you’re pressed on time, you may want to look at hiring a contractor. Personally, when it comes time to drywall the other wall in my garage next summer, I’ll still do it myself. I’m not in a rush to do the job and I’d rather put the money to better use than paying a contractor.